Industry tech legend John Carmack thinks he can get high-tech shooter Rage running on an iPhone - but that doesn't make it a good idea. 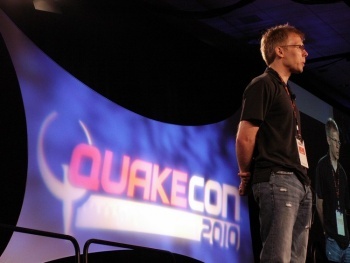 id Software's upcoming Rage is a very pretty game - which is why it was a bit mindblowing when tech brainiac John Carmack revealed at QuakeCon 2010 that he was able to run the shooter on his iPhone thanks to some clever optimization. Could the legendary Carmack actually port a high-tech PC/console FPS onto a mobile device? According to Carmack himself, the answer is yes; whether or not it's a smart idea is another question entirely. "While it would (amazingly!) actually be possible to compile the full-blown PC/console Rage game for an iPhone4 with some effort," Carmack wrote on the Bethesda blog, "it would be a hopelessly bad idea." After all, even the most successful optimizations have to start making trade-offs when dealing with such disparate levels of hardware. "Even the latest and greatest mobile devices are still a fraction of the power of a 360 or PS3, let alone a high-end gaming PC," said Carmack, "so none of the carefully made performance trade-offs would be appropriate for the platform, to say nothing of the vast differences in controls." In hindsight, Carmack admitted that his QuakeCon reveal of Rage had probably misled gamers to thinking that the game's full experience would be hitting Apple's popular handheld device. What he introduced as "Rage. On the iPhone. At 60 frames a second," had been a tech demo and nothing more. That doesn't mean that iPhone users won't be seeing any Rage-y fruit from that tech demo, though. In the same blog post, Carmack announced that it would be releasing a "little slice of Rage" for the iPhone in the form of Mutant Bash TV, a "post apocalyptic combat game show" set in the Rage wasteland. Mutant Bash TV will play like a typical arcade-style FPS, revolving around surviving to the end of the level with the highest score possible. Mutant Bash TV will likely cost $0.99 or $1.99 when released, and Carmack says the game will come in quite a large file size by iPhone/iPad standards - with the HD version predicted to clock in at around a 1.4GB - but it'll also be quite technically robust. "What we do have is something unlike anything ever seen on the iOS platforms." If Carmack's plan to deliver an iPhone game out of a tech geek's dreams surprises you, it really shouldn't - he is a bona fide rocket scientist, after all.